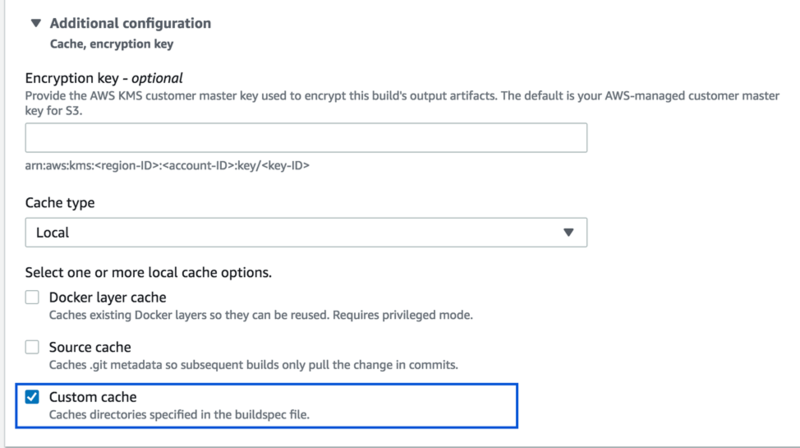 AWS CodeBuild now supports local caching, which makes it possible for you to persist intermediate build artifacts locally on the build host so that they are available for reuse in subsequent build runs. Your build project can use one of two types of caching: Amazon S3 or local. In this blog post, we will discuss how to use the local caching feature. Local caching stores a cache on a build host. The cache is available to that build host only for a limited time and until another build is complete. For example, when you are dealing with large Java projects, compilation might take a long time. You can speed up subsequent builds by using local caching. This is a good option for large intermediate build artifacts because the cache is immediately available on the build host. Projects with a large, monolithic source code repository. Projects that generate and reuse many intermediate build artifacts. Projects that build large Docker images. Projects with many source dependencies. 1. Open AWS CodeBuild console at https://console.aws.amazon.com/codesuite/codebuild/home. 3. In Project configuration, enter a name and description for the build project. 4. In Source, for Source provider, choose the source code provider type. In this example, we use an AWS CodeCommit repository name. 5. For Environment image, choose Managed image or Custom image, as appropriate. For environment type, choose Linux or Windows Server. Specify a runtime, runtime version, and service role for your project. 6. Configure the buildspec file for your project. 7. In Artifacts, expand Additional Configuration. For Cache type, choose Local, as shown here. Source cache mode caches Git metadata for primary and secondary sources. After the cache is created, subsequent builds pull only the change between commits. This mode is a good choice for projects with a clean working directory and a source that is a large Git repository. If you choose this option and your project does not use a Git repository (GitHub, GitHub Enterprise, or Bitbucket), the option is ignored. No changes are required in the buildspec file. Docker layer cache mode caches existing Docker layers. This mode is a good choice for projects that build or pull large Docker images. It can prevent the performance issues caused by pulling large Docker images down from the network. You can use a Docker layer cache in the Linux environment only. You should consider the security implications before you use a Docker layer cache. Only directories can be specified for caching. You cannot specify individual files. Symlinks are used to reference cached directories. Cached directories are linked to your build before it downloads its project sources. Cached items are overridden if a source item has the same name. Directories are specified using cache paths in the buildspec file. In the build project configuration, under Artifacts, expand Additional Configuration. For Cache type, choose Local. Select Source cache, as shown here. In the build project configuration, under Artifacts, expand Additional Configuration. For Cache type, choose Local. Select Docker layer cache, as shown here. Under Privileged, select Enable this flag if you want to build Docker images or want your builds to get elevated privileges. This grants elevated privileges to the Docker process running on the build host. In your buildspec file, specify the cache path, as shown here. In the build project configuration, under Artifacts, expand Additional Configuration. For Cache type, choose Local. Select Custom cache, as shown here. - echo "Enter pre_build commands"
- echo "Enter build commands"
We hope you find the information in this post helpful. If you have feedback, please leave it in the Comments section below. If you have questions, start a new thread on the AWS CodeBuild forum or contact AWS Support. AWS CodeBuild now makes it possible for you to access Docker images from any Amazon Elastic Container Registry repository in another account as the build environment. 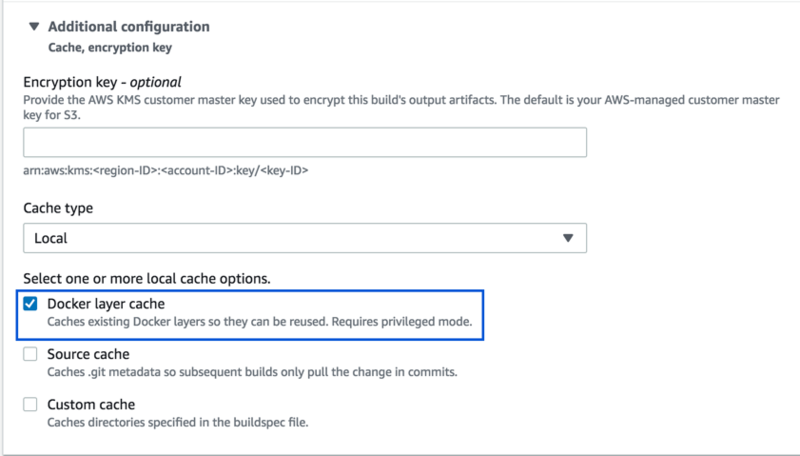 With this feature, AWS CodeBuild allows you to pull any image from a repository to which you have been granted resource-level permissions. In this blog post, we will show you how to provision a build environment using an image from another AWS account. 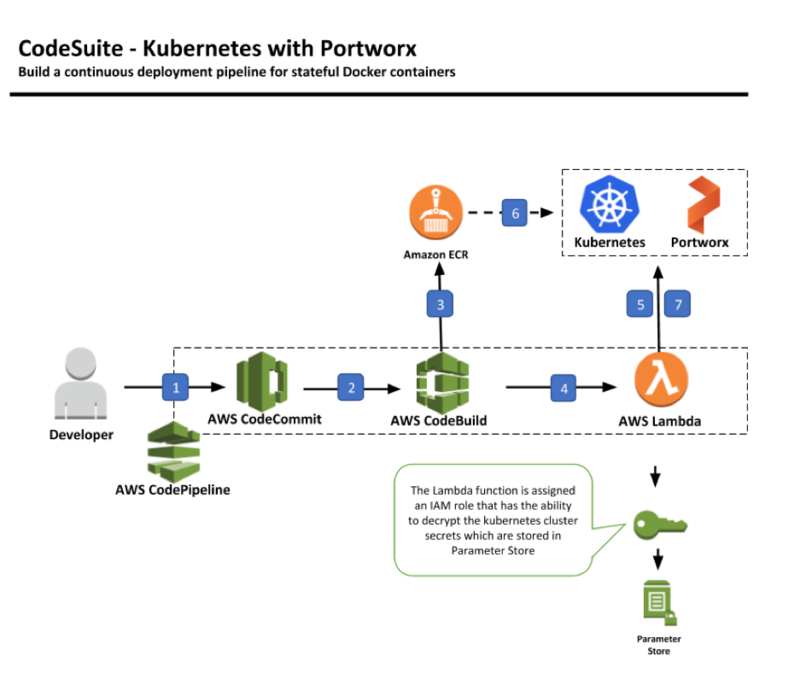 AWS CodeBuild is a fully managed continuous integration service that compiles source code, runs tests, and produces software packages that are ready to deploy. It provides a fully preconfigured build platform for most popular programming languages and build tools, including Apache Maven, Gradle, and more. Amazon Elastic ECR is a fully managed Docker container registry that makes it easy for developers to store, manage, and deploy Docker container images. We will use a sample Docker image in an Amazon ECR image repository in AWS account B. 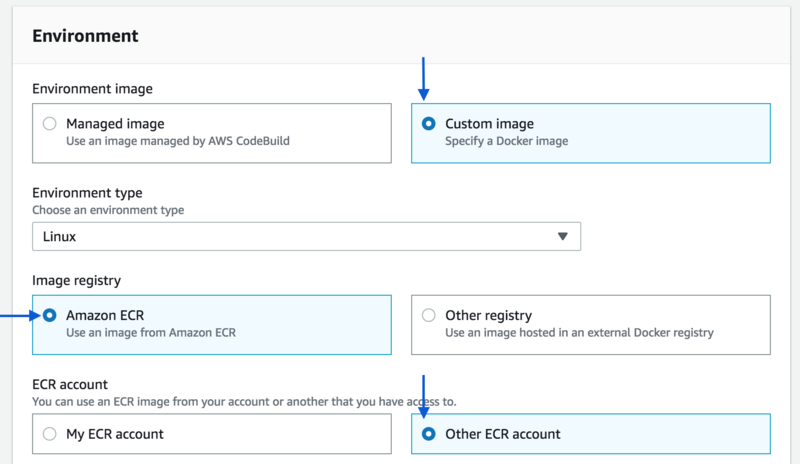 The CodeBuild project in AWS account A will pull the images from the Amazon ECR image repository in AWS account B. · Two AWS accounts (AWS account A and AWS account B). · In AWS account A, an image registry in Amazon ECR. In AWS account B, images that you would like to use for your build environment. If you do not have an image registry and a sample image, see Docker Sample in the AWS CodeBuild User Guide. · In AWS account A, an AWS CodeCommit repository with a buildspec.yml file and sample code. 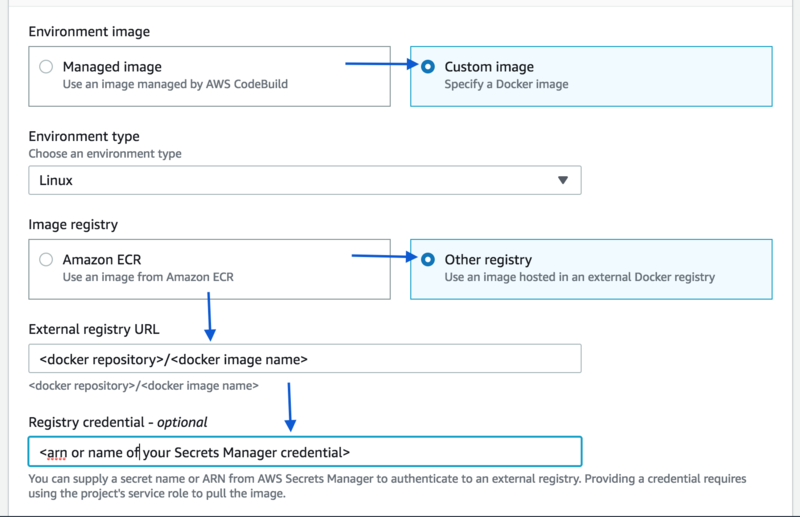 · Using the following steps, permissions in your Amazon ECR image repository for AWS CodeBuild to pull the repository’s Docker image into the build environment. 1. 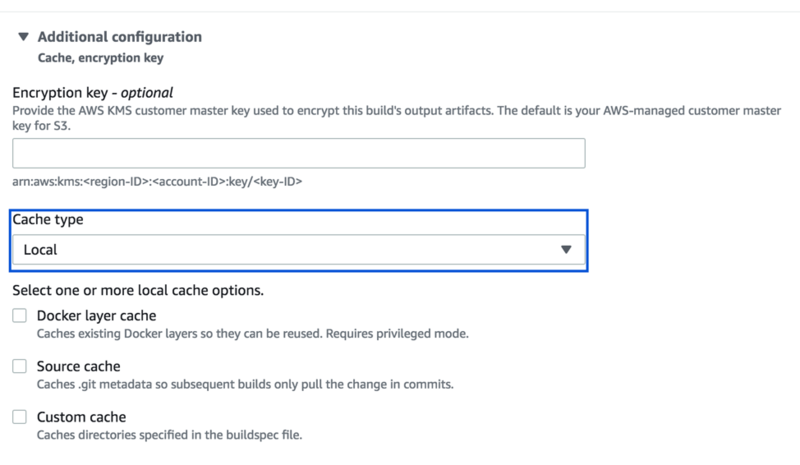 Open the Amazon ECS console at https://console.aws.amazon.com/ecs/. 2. Choose the name of the repository you created. 3. On the Permissions tab, choose Edit JSON policy. 4. Apply the following policy and save. "AWS": "<arn of the service role>"
1. Open the AWS CodeBuild console at https://console.aws.amazon.com/codesuite/codebuild/home. 4. In Source, for Source provider, choose the source code provider type. In this example, we use the AWS CodeCommit repository name. 5. For Environment, we will pull the Docker image from AWS account B and use the image to create the build environment to build artifacts. To configure the build environment, choose Custom Image. For Image registry, choose Amazon ECR. For ECR account, choose Other ECR account. 6. 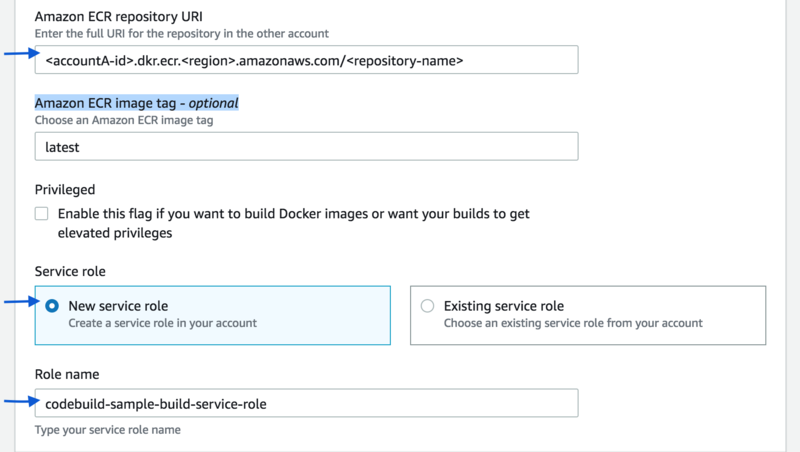 In Amazon ECR repository URI, enter the URI for the image repository from AWS account B and then choose Create build project. 7. Go to the build project you just created, and choose Start build. The build execution will download the source code from the AWS CodeCommit repository and provision the build environment using the image retrieved from the image registry. If you have any feedback, please leave it in the Comments section below. If you have questions, please start a thread on the AWS CodeBuild forum or contact AWS Support. AWS CodeBuild now supports using a Docker image that is stored in a private registry as your runtime environment. Previously, the service supported the use of Docker images from public Docker Hub or Amazon ECR only. In this blog post, we will show you how to use a Docker image from a private registry to create the AWS CodeBuild runtime environment. The credentials for the private registry are stored in AWS Secrets Manager. Docker Hub repositories allow you to share container images with your team, customers, or the Docker community at large. AWS Secrets Manager protects secrets required to access your applications, services, and IT resources. The services makes it possible for you to easily rotate, manage, and retrieve database credentials, API keys, and other secrets throughout their lifecycle. · A private repository or account. · A Secrets Manager secret that stores your Docker Hub credentials. The credentials are used to access your private repository. · An AWS account to create an AWS CodeBuild project. · A service role created in IAM that grants access to your Secrets Manager secret. · An AWS CodeCommit repository set up in your AWS account with a buildspec.yml file and sample code. on the Docker website. Alternatively, you can execute the following commands in a terminal to pull an image, get its ID, and push it to a new repository. 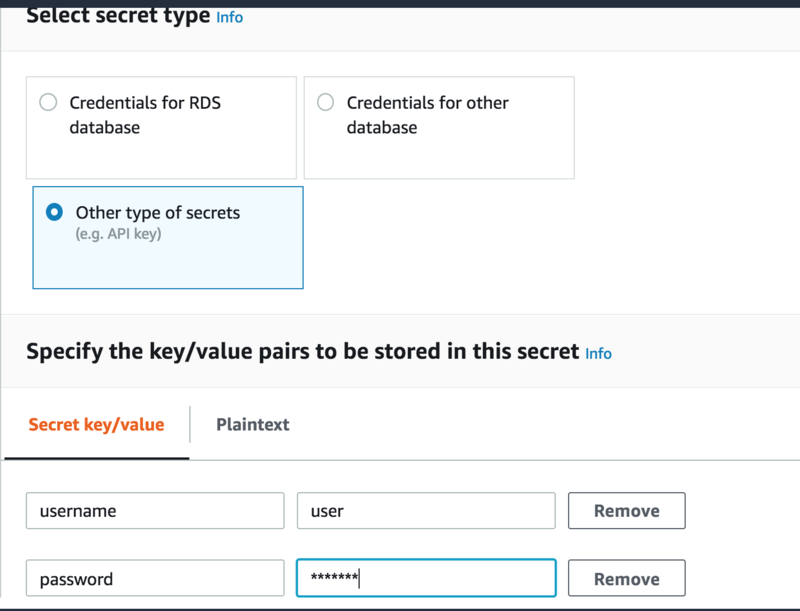 In AWS Secrets Manager, a basic secret is one with a minimum of metadata and a single encrypted secret value. The one version that’s stored in the secret is automatically labeled AWSCURRENT. 1. Open the AWS Secrets Manager console at https://console.aws.amazon.com/secretsmanager/. 2. Choose Store a new secret. 3. In the Select a secret type section, specify the kind of secret that you want to create by choosing Other type of secrets, and then enter a user name and password to access your private registry. 4. In Secret key/value, create one key-value pair for your Docker Hub user name and one key-value pair for your Docker Hub password. 5. For Secret name, enter a name, such as dockerhub. You can enter an optional description to help you remember that this is a secret for Docker Hub. 6. Leave Disable automatic rotation selected because the keys correspond to your Docker Hub credentials. 7. Review your settings, and then choose Store secret. If your private registry is in your VPC, it must have public internet access. AWS CodeBuild cannot pull an image from a private IP address in a VPC. 3. In Project configuration, for Project name, enter a name and description for the build project. 4. In Source, for Source provider, choose the source code provider type. In this example, we are using the name of an AWS CodeCommit repository. 5. We will pull the Docker image from a private registry and use the image to create the build environment to build artifacts. To configure the build environment, in Environment, choose Custom image. For Environment type, choose Linux or Windows. For Custom image type, choose Other location, and then enter the image location and the ARN or name of your Secrets Manager credentials. 6. Go to the build project you just created, and choose Start build. The build execution will download the source code from the AWS CodeCommit repository and provision the build environment using the image retrieved from the registry. 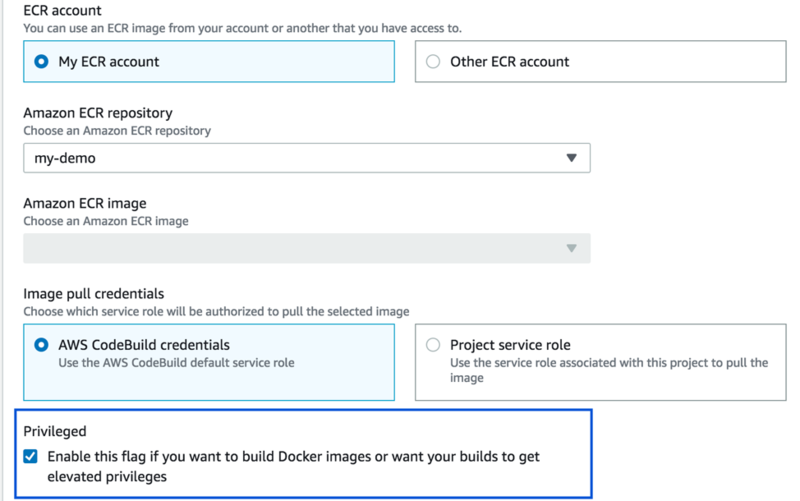 Using the above guidelines, you now can now provision build environment using docker images from private registry. 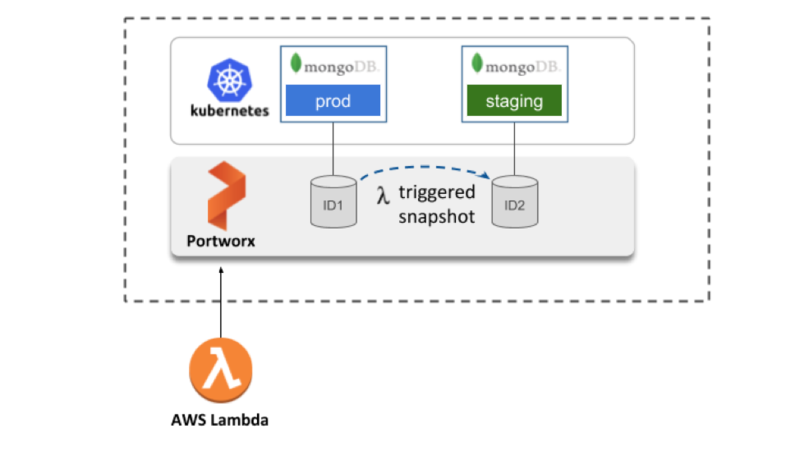 Now that you have seen how to use Docker images to provision build environments from a private registry, you can integrate a build step in AWS CodePipeline and use the build environment to create artifacts and deploy your application. 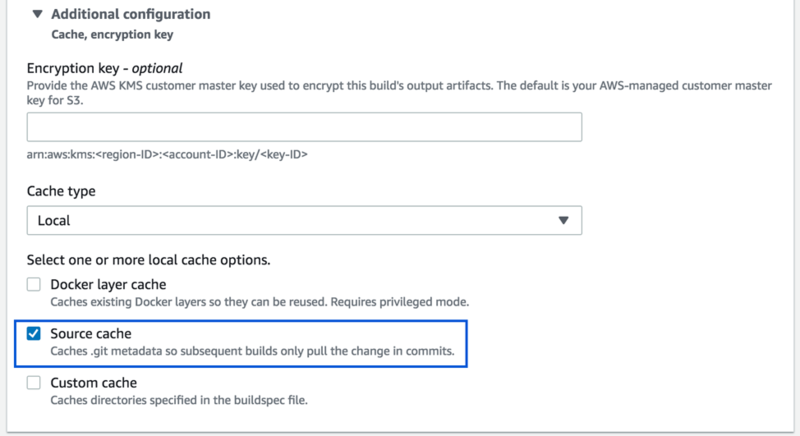 To integrate a build step in your pipeline, see Working with Deployments in AWS CodeDeploy in the AWS CodeDeploy User Guide.